Symphony No 3, Op. 36 (1977). Region code: Worldwide. Video: 4:3; Sound: PCM Stereo. This is a famous film. I believe it was made for London Weekend Television’s The South Bank Show when Melvyn Bragg’s weekly arts programme was in its pomp. It was certainly through that show that I once saw the film though I don’t believe I’ve seen it since. That’s why I was particularly glad to have the opportunity to see it again now that it has been released on Blu-ray. Around the time that the film was shown – quite probably as a result of seeing the TV programme - I bought the Elektra Nonesuch CD of the symphony (7559 79282-2). That was made by the same artists who perform the work on this film though I don’t believe that recording was used as the soundtrack for the film. I base that assumption chiefly on the fact that the production and engineering team responsible for the 1991 CD recording are not named in the Arthaus credits. The performance of the symphony is a very good one – as is the performance on the Elektra Nonesuch CD. Dawn Upshaw sings with tremendous intensity and an evident feeling for the words. 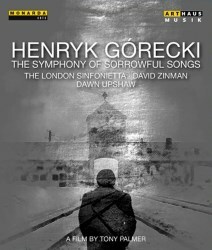 David Zinman draws eloquent playing from the London Sinfonietta. As my late colleague, Bob Briggs pointed out a few years ago in a review of another recording of the symphony, it is mainly the strings that carry the burden of the musical argument; contributions from other sections of the orchestra are very limited. I imagine that the Sinfonietta’s string choir was reinforced quite a bit for this assignment; Zinman has a large number of string players at his disposal. Throughout each of the movements we see quite a lot of film of the performers but these pictures are interleaved with other, relevant images, many of which are often disturbing. Tony Palmer is a renowned director of musical films and this is a very good example of his craft. There are a few occasions when Górecki, seated at a piano in his study, talks directly to camera. He speaks movingly about the symphony and the time of its gestation. It’s salutary to hear him say that under the Communist rule in Poland he was “deleted from Polish culture”. His home in Katowice was only some twenty miles from Auschwitz and he relates how a few years after the end of World War II he was taken on a school trip to Auschwitz where, he says, the buildings still felt warm to him. The terrible events at Auschwitz clearly made a huge impression on him as he learned more about the evils that had been perpetrated there. Speaking of the Third Symphony, he says “somehow I had to take a stand as a witness and a warning”. During the performance of the long first movement of the symphony Palmer includes quite a lot of film of the composer walking alone around Auschwitz. Palmer interleaves these modern images of the place with archive footage of the atrocities committed there. Sadly, we have seen such images before but even so I found the archive pictures especially harrowing. Palmer’s approach is anything but sensationalist yet this section of the film is far from easy to watch – and rightly so. Górecki points out that in our world suffering did not come to an end with the liberation of the Nazi death camps and that thought is revisited during the third movement. The second movement, however, offers some respite, at least visually. Here the composer set a prayer scratched on the wall of a cell in a Gestapo prison. The musical setting is tragically affecting yet Palmer illustrates much of the music through pictures of religious statues and icons. The images are discerningly chosen. Finally, in the third movement we come back to the composer’s reminder that terrible things are still happening in our world. There’s quite a lot of footage of starving children and it’s pitiful to see the plight of these children. Towards the end Palmer also includes some images which, I think, show the aftermath of the use of chemical weapons by the regime of Saddam Hussein. Disturbingly, we also see Saddam receiving kisses of greeting from clearly nervous children. There are also some pictures which I believe show the sufferings of civilians during the Bosnian civil war. As you’ll have gathered, much of the imagery in this film is hard-hitting but that’s the right approach. Górecki’s Third Symphony bore eloquent testimony to the suffering of innocent people and Palmer’s choice of imagery complements the music shrewdly. The film is now over twenty years old. It’s a shame we can’t view it in wide screen. However, the picture quality is otherwise perfectly satisfactory, as is the sound. Whichever CD recording of this powerful symphony you possess – even if it’s the Upshaw/Zinman version I would say that this film is an important supplement. It should deepen your appreciation of Górecki’s Third Symphony.